As a startup entrepreneur, I need to be careful with my cash. I have put a lot into my newest venture, uGurus, and will continue to invest heavily as we are aggressively growing the business. Not only that, but my wife and I just welcomed our first child into the world last summer. Family expenses have skyrocketed compared to our bohemian apartment life just a few years ago. I hate stressing about money. I want to spend less than I make, save for the future so I can enjoy guilt-free travel, nice stuff, and put my earnings to work in various investments. I’d like to be well positioned to angel or venture invest in my 40s and 50s. To keep spending in check, I’ve tried just about everything. Mint, Dave Ramsey, and Ramit Sethi, and many hours swallowed up in my own homegrown spreadsheets. Nothing ever seems to stick for longer than about 30 days. And one last note here is this: I despise consumer credit card debt. Interest rates are insane and I do everything to never carry a balance that I possibly can. I found Dave Ramsey’s podcast years ago and loved it. Financial discipline. Budgets. Debt FREEEEEEDOOOOOOOOM (you’ll know what I’m talking about if you’ve ever listened to his program). Dave advocates a monthly, category-based budget. He even goes as far as cash envelopes if you want to take it that far. But in practice, I’ve never gotten a multi-category, monthly budget to work. Some of your money must go to clothes, food, gas, etc. Some % here and another % there. But life doesn’t work like that. It comes in waves and fluctuations. Not constants percentages. Not only that, but keeping track of 10-15 categories of spending makes my brain hurt. Even if you reduce that down to 6 or 7 categories, it’s still a lot to keep track of. You have to keep a running tab of everything all the time in those categories. Sure, Mint can help, but there’s nothing more depressing than getting an email at the end of the week that you went over budget in 75% of your categories. Maybe you’re different. Maybe you thrive on a category-based, monthly budget, but I don’t. 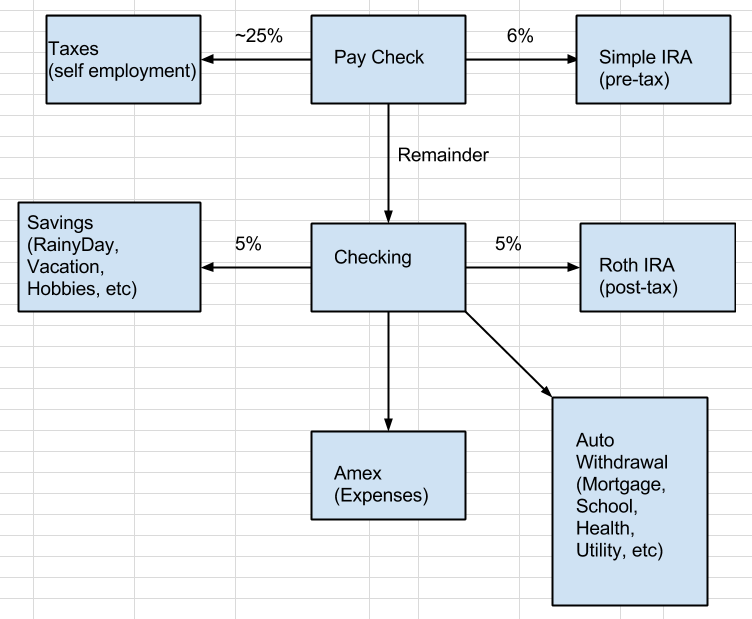 A while back I got turned on to Ramit Sethi and discovered his financial automation system. It took me a bit to implement, but after creating a handful of new bank accounts and automated withdrawal and investing settings, I got it going. Ramit’s whole method has a “guilt-free spend what’s left” idea. Basically, get all of your stuff saved and paid and spend what comes out the other end. Which is great. But here’s the problem… it implies a monthly bucket. Keeping track of how much money you have left to spend for a 30 day period of time is WAY too long. This is another factor of why multi-category budgets don’t work for me. When I have to keep track of my budget for an entire month, I get off track after 10 to 15 days and end up eating mac and cheese the rest of the month (or just saying screw it and pulling from savings). Even with automation and a bucket of guilt-free spending, I was coming up short. One of the hardest elements with money in a family is talking about it. We can budget all day long, but if my wife and I aren’t in total, absolute sync about what we are spending and what we aren’t, then it’s all for naught. I also want my son and other future children to grow up in a household where they are taught about money, the value of it, and how to approach it with responsible discipline. I believe that the only way this can be taught is by creating and exercising habits that are easy to understand, transferable (doesn’t just work for me), and are repeatable. As I have tried to budget and plan finances over the last few years with my wife, we would periodically talk about money (like every 2-3 months when I would do a super-budget). For a bit we would get on the same page. Then it would go unspoken for a while until the next super-budget. Hence the “frazzled.” And just for the record, my wife and I both live very reasonably. No one is buying extravagant stuff or going shopcrazy. What we experience with money is just being a little bit off every month. Spending just a little too much or not planning big purchases. And money is annoying to talk about. To ever say, “we need to cut expenses” might sound like an attack on the other. But money is just money. It’s very binary. It’s either there or it isn’t. You have it or you don’t. Just keep earning more so you can spend ever more. I have seen a few millionaires completely crash and burn due to this way of thinking. Even though I know increasing earning power is a great mindset and plan, reality rarely works out quite that straight forward. We experience ups and downs. Fluctuations. It’s never just up and to the right all the time. No matter how much money you make, you still have to spend less than you make otherwise the party will eventually end and the music will stop. I have earned more every year for the last fifteen years. Each year I take home more from my businesses than the previous year. But my expenses have continued to rise. Family, house, education, etc. Chances are as my kids get older, I will continue to see my expenses grow all the way through putting them through college. I hold a personal belief that even as I earn more, I must continue to be disciplined about money if I am going to reach the goals I set out for. I believe I have this in common with a very influential magnateand am happy to keep this mindset. Even as I believe in abundance and the power of earning more. About a year ago I started using a system called EOS in my business. This program uses a scorecard with weekly numbers. The scorecard helps you track numbers in small increments so you can improve activity without having to make big changes. I decided to ditch the idea that I would have a monthly budget. It was too hard. Too onerous. I needed a single number to focus on. And I needed this number to just hang over my head for a week. Automated my money based on Ramit’s system. Created a spreadsheet that added up all of my fixed monthly expenses (mortgage, insurance, cable, power, water, internet, cell phone, savings, HSA, investing). Added a column for “annuals” that summed all of the big stuff that recurs every year (auto insurance, flushing sprinklers, car registration, Amazon Prime, credit card annual fees, etc); take this number and divide it by 12. 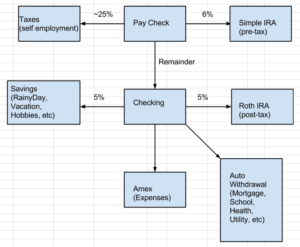 Setup savings account to auto withdraw an escrow amount each month for annual payments on a monthly basis (and taxes if you are self-employed); this monthly amount will just figure in with your fixed-monthly expenses. Multiplied my monthly fixed expenses and savings targets by 12, and divided the whole thing by 52. What comes out the other end of this system is a single number that you can track to the week for non-fixed expenses. If I hit my goal every week, I will actually have a little bit of money left over (the difference in what I spent and my goal) plus an extra 10%. This extra dough can be whatever you want it to be. Since I’m focused on a 90 day window for big decisions and commitments, every quarter I will add up this weekly buffer (assuming we stay on track) and can use this as a way to reward ourselves for staying on budget. It can go to hobbies, gifts, or into one of our savings funds. I created the “cap” and “goal” system for a specific reason. Since I want my finances to be completely automated, and I don’t want to have to rebuild my budget system every few months, as long as I stay below my “cap,” I won’t ever have to worry about rebuilding my budget in the future. As part of our saving / investing system, we have a “rainy day fund” which would be tapped if there was truly something that came out of the blue. An HSA auto-invest for health related stuff. A “travel” fund for trips and stuff. And a few other accounts for hobbies and long term investing. The idea is that as much as possible is taken into consideration to get to your weekly number so you don’t have to go back to rebuild the system. This also means that trips, medical expenses, etc won’t completely throw off your budget (which is something that would happen all the time before). I just want to emphasize something: once you have your single number, this is the one and only number you will have to think about each week. As long as you stay within that number, all will be good (and then some). Getting to a single number for non-fixed expenses turned out to not be enough. I tracked this for a few weeks and every week I would run the numbers and see that we missed our goal. My wife and I would both look at Mint during the week, but the problem with Mint is that it was pulling ALL of our transactions into the feed. It’s hard to keep track of your non-fixed expenses when there are tons of transactions hitting your account all week that don’t figure in. So on a walk one day I came up with an idea. We’ll keep a weekly non-fixed expense log on the refrigerator. Whatever each of us spends, we just have to write up there each day so the other can see and keep a running tally. Within a week, we went from being about 30-50% over budget to 10-20% under. After a while, my wife and I started to have open communication about “what’s coming up?” and got a grip on how little things impacted the weekly budget in a big way (ie. me going out to breakfast, coffee, and lunch everyday). And instead of buying stuff when we felt like it, we talked about it, and planned for expenses to hit when it made sense. This simple one-page log was the last piece in the puzzle for us. I am happy to say that we’ve been able to stick to this system for 3 months and it’s going strong. Not only are we a lot less stressed about money, but we are hitting our savings goals, and planning our expenses, trips, and hobbies accordingly. Money went from being something we occasionally had really BIG talks about when the pot would be boiling over, to a series of lots of small conversations about it. That’s it. Hit me up on Twitter (@brentweaver) if you have questions or would like to know more about this system.